People come and go; civilizations rise and fall; magics shape the face of the world. Yet one thing always remains constant: Aloria. Aloria, the name given to the planet upon which the Humans, Nelfin, Gorr, Dargon, and other races reside upon, is a vast and expansive land that too few see too much of. Covered in rolling hills, luscious jungles, perilous mountains, frozen tundras, arid deserts, echoing canyons, and wavy oceans, the land is as diverse as it is wide. Nations and states war with one another, while flora and fauna thrive. At the same time, Aloria can be a dangerous and harsh place to those who succumb to starvation, disease, magic, fire, or even the blade. This land is one which has seen thousands of years of history, from the great and mighty Seraph to the transformed Mekett, who were once known as the Meraic. Scholars estimate that only around 30% of Aloria has been discovered by civilizations such as the Regalian Empire and the Songaskian Masaya. That being said, there are still many unknown people to meet, and hundreds of hidden places to discover. The Seraph are the oldest and first known civilized people in all of Aloria and are thought to have died out seven thousand years ago, but are estimated to have lived well before thirteen thousand years ago. Built upon magical prowess and daring arcane discovery, the Seraph were the first to establish a link to the Void and Exist, as well as bring Estel (and subsequently the Arken) to Aloria. The Seraph, in all their hubris glory, were felled after their greed to tap into magic best left untouched led to the first Void Invasion. This began a long series of cyclic events that would each end in a Void Invasion and a subsequent scattering and rebuilding of society, only to be undone again. The Second Civilization is one of the two civilizations hardly known of by modern Alorians. This is mostly due to the short amount of time that they had to make an impact on history; the Second Civilization’s tenure was less than five years long. These five years began after the Seraph completely died out. At the end of its existence, the Second Civilization disappeared completely from Aloria without a trace, making it the most difficult to research and understand. Like the Second Civilization, the Third Civilization is one shrouded by mystery and intrigue. It is up to speculation who or what the Third Civilization was; the civilization did not last long before it was wiped out due to their excessive use of magic. The Third Civilization ended nearly six thousand years ago. The Meraic are one of the most well-known ancient civilizations. These magically-inclined people rivalled the Seraph in terms of their abilities to harvest and wield magic, and were great collectors of knowledge. The Meraic Civilization lasted until about four thousand years ago, when most of their numbers were destroyed. The rest of their race fled into the safety of their Chrysalis Stasis tunnels below Hadar, eventually evolving into what the modern Mekett is today. Still, most of this ancient knowledge has been lost to time simply due to the loss of memory experienced by the old Meraic post-stasis. The fifth and final civilization, the Nelfin, are consequently the most well-known. The Nelfin, like the civilizations before it, formed the remnants of Aloria into a mighty empire, dominating all surrounding races and cultures with their magical prowess. Unlike the civilizations before it, the Elven Empire technically managed to stop the cycle by surviving the Void Invasion entirely by accident. Unbeknownst to most Alorians, the underlying events of the Cataclysm, including the actions of the Arken and the Great Ice Dragon, staved off the systematic purge of the Nelfin, and enabled the limited survival of many of their numbers. Unfortunately, the longevity of the Elven Empire was shattered due to the inadvertent effects of the Cataclysm, as well as the political disasters of the Elven Civil War, Orc Invasion, and more. Some scholars argue that Aloria is still in the Fifth Civilization because the Elven races still remain a noteworthy political force in Aloria. Others argue that the Cataclysm marked the end of the fifth, and the start of a sixth. The Ailor Civilization, spearheaded by the Regalian Empire, is thought to be one of the best Civilizations to live in. The Ailor have access to what is generally accepted as the most advanced technology across all boards, specifically that of medicine and science. Additionally, whereas other civilizations were centered on one specific race, the Ailor Civilization has (after the turn of its third century) become largely tolerant of other races. Finally, and perhaps most importantly, the Ailor are not entirely reliant upon magic, whereas previous civilizations were. Aloria is a diverse land filled with varying continents and fluctuating climates, as well as different flora and fauna. One simply cannot generalize about the planet, which is, as a whole, largely undiscovered by societies such as Regalia, the Masaya, and more. 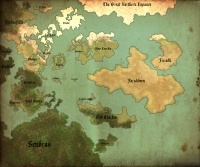 There are dozens of nations and states that dot the planet of Aloria. As of late, Aloria is experiencing a polarization of nations and states into super-empires, where individual countries are amassing large swaths of land as well as adopting more efficient administrative bureaucracy to run it. Aloria was the name of the first IG world ever created in Massivecraft. While some higher scholars and nobles may understand that Aloria is somewhat spherical, or that Regalia is not the only big civilization in existence, the common people are almost entirely likely to assume that Regalia is the biggest and most powerful nation on their flat world. Space travel has not yet been discovered by Alorians. This page was last edited on 27 May 2017, at 04:28.